I’m told I need to get a crock pot. Because we a have a Vitamix (love it! ), a toaster oven, a coffee bean grinder (the Hub’s), a French press as well as a food processor, I’m not keen on adding to the arsenal. But I have friends that swear by their crock pots, that they can load up in the morning, leave to slow-cook all day while they’re out ‘gettin it done’ and return home to an already made dinner. And because this blog is meant to provide easy meals under budget, I must be willing to try things outside of my norm, right? 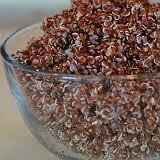 If you buy quinoa in bulk, consider rinsing quinoa in a fine mesh strainer until the water runs clear. I don’t rinse the quinoa that comes in the orange box from Trader Joe’s. 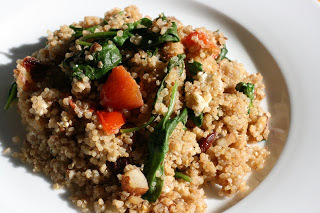 Dump quinoa into the crockpot. I used my 6qt Smart Pot for this dish. Cover and cook on low for 4-6 hours, or on high for 2-4. The quinoa is done when you can fluff it with a fork and it is tender. The liquid should be pretty well absorbed, similar to how you know rice is done. yum yum! will be making soon…although pk won’t touch with a 10 foot pole. eli will eat the quinoa though…he loves it! Ha! can you roll it in to balls and deep fry them for PK?! Have you done this yet for PK? BTW finally got Health Assessment site working properly, sorry for the trouble@! great free info in there!